The SmartShake Neon Blue Shaker Cup is a high-quality 600ml shaker cup with three compartments to store pills and powders. It is made from BPA free plastic and is 100% leak-proof. You can use it every day, store it in the freezer, heat its contents in the microwave and wash up in the dishwasher afterwards. It’s designed for real life. 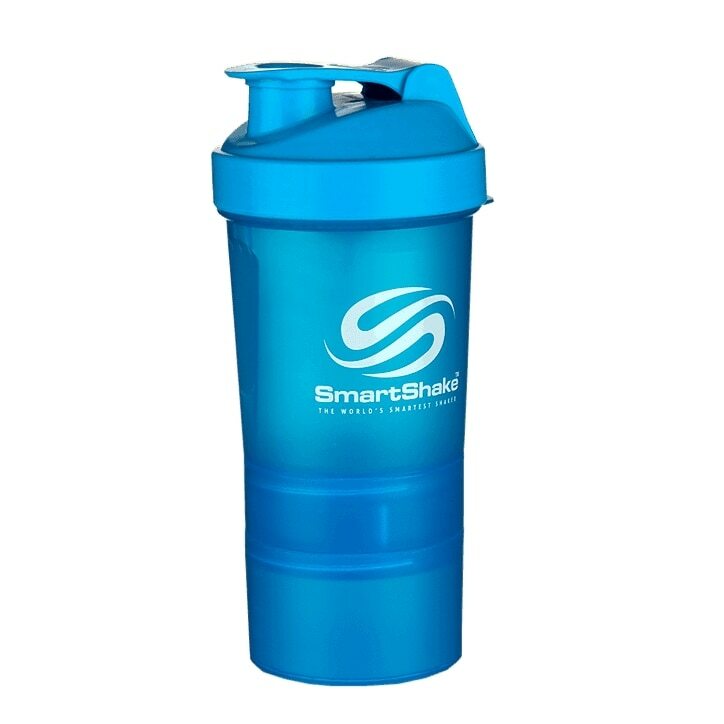 SmartShake Neon Blue Shaker Cup’s unique design is compact, yet light. And thanks to its snap-on strainer, there are no loose parts. SmartShake Neon Blue Shaker Cup is rated 4.7 out of 5 by 6. Rated 5 out of 5 by Anonymous from Brilliant Great shaker, the bottom screws off and you can use it to store things. I use it to store another scoop of whey so i can have 2 shake's a day without needing to carry a massive tub of whey with me everywhere i go. At first I thought the actual shaker was a bit small but it does the job to be fair. Really happy with it and recommend. Rated 5 out of 5 by Gingertom16 from Very Convenient! I own this shaker and the white version of it. This shaker is very good quality and can be customised to you. The main part of the shaker is a little small but it will still fit all shakes into it. When I put serious mass inside this I had to put one scoop in, shake it up, then put another scoop in and shake it up. For other protein powders that use less powder you wont have to do this. The middle section has a cross section to keep pills neatly organised but can be removed if you want to put something else in there. The bottom section is a decent size and good for storing protein so you do not have to carry a big tub or bag around with you. Overall great product and great value for money! Rated 5 out of 5 by pglewis from Love it Perfect shaker cup. Love that it holds a number of powders or pills and you can use before, during and after a workout. Simple design but very effective and it looks good as well. Rated 4 out of 5 by MissS16 from Great! Great shaker cup. It is a bit small as it only holds 400 ml (500ml if you fill it up until the first rim). But great portable cup for protein shakes. Also love the little attachable cups for extra protein and pills. Rated 4 out of 5 by Shannon from Great! Great product but got to keep refilling unfortunately but i like how they have organised bottom for pills/supplements plus great quality.